Recovering from the disease of addiction is hard work at any age, and it can be especially challenging in college when so many social activities seem to revolve around abusing substances—from fraternity and tailgate parties to concerts and sports events to everyday dorm life. It doesn’t take long for new students to question whether anyone gets through college sober much less in recovery. The relatively recent movement to establish collegiate recovery communities and sober dorms and halls is long overdue and can be lifesavers for students who are pursuing higher education while in recovery. Increasingly, students don’t have to leave campus to find a 12-step meeting, substance-free social activities, or a counselor who understands addictions. But for some students, especially those in early recovery, more support may be needed to successfully navigate entry or re-entry to college. That’s where transitional living communities like Next Step Recovery in Asheville, NC, come in. Next Step Recovery is an off-campus community that provides additional levels of structured support and recovery education for men in early recovery. The program supports more than 20 men at a time, primarily between the ages of 18 and 25, who live in one of four residential houses. As part of Next Step Recovery’s sober living community, residents have 24/7 access to recovery support from peers and a team of 10 staff members that includes licensed addictions specialists, case managers, and onsite house managers. Located just minutes from the University of North Carolina at Asheville, which has a CRC, and a number of other excellent public and private universities and community colleges, Next Step Recovery offers an intensive outpatient program for residents who need extra recovery support to be successful. All residents participate in 12-step and weekly house meetings, relapse prevention education, dialectal behavior therapy for relapse prevention, and outdoor adventure therapy. House and case managers help ensure every resident finds a sponsor, develops a relapse prevention plan, works a daily 12-step program, and secures full-time education and/or paid or volunteer work. Next Step Recovery’s staff also help families understand the disease of addiction and how to support their own healing and their son’s recovery process. A typical day at Next Step Recovery might start with making breakfast, heading to school, work, or volunteering, having lunch, checking in with a case manager when needed, cooking dinner with housemates, participating in group dialectical behavior therapy with other residents, and attending an AA/NA meeting before heading back home. 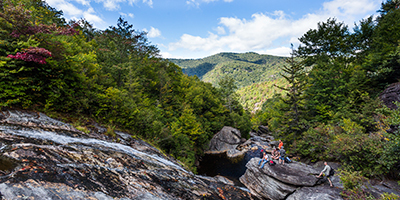 Weekends might include a day hike in the mountains with fellow community members and Next Step Recovery staff and then heading back to Asheville to relax, cook dinner, and head out to a meeting. Every step of the way, residents have access to peers and staff who are committed to their own recovery process, each other, and living a successful substance–free life. If you are considering going (back) to college but haven’t chosen one yet, be sure to look for a school that has a CRC, on-campus 12-step meetings, and substance abuse counseling services. Investigate the recovery resources that are available in the surrounding community. And, if you are early in your recovery, consider living in a sober living community like Next Step Recovery to ensure you have the support you need to be successful both in school and in the rest of your life.